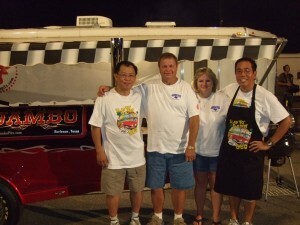 The Casablanca Casino contest at Mesquite, Nevada, on September 5, 2009, was our first episode on the new reality TV show on TLC called BBQ Pitmasters which aired on the Season Premier on December 3, 2009. We were recruited a couple of weeks earlier and joined last minute as the 7th team. The show had been in development a couple of years and the six chosen teams were ready to go. 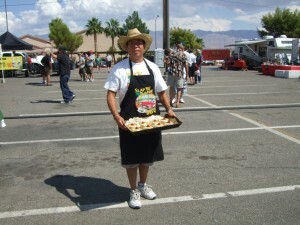 It was by pure chance that I met Carolyn, a KCBS official, at the Stagecoach 2008 contest that set off a chain of events which resulted in the producer John Markus calling us. Apparently, John got a call from his friend Carolyn who told him that he needed to add two really nice IT geeks from LA to his new show. John called me in the middle of rib turnin at the August Fairfield contest. I thought someone was pranking me. How else do you react when someone calls and says, “Hi, I’m John, a TV producer from New York, and I’d like to find out if you’re interested in being on a TV show.” Yeah, sure. Please don’t do what I did. 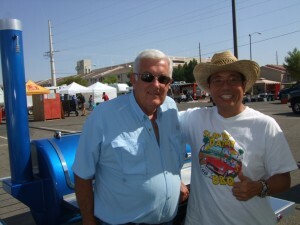 I thanked John for the call and told him I’d call him back Monday as I was busy. Hah! I forgot about the call until Mark and I were making the 7 hour drive back to LA from Fairfield. I told Mark some dude claiming to be from NY called me about a TV show. We laughed as by now I was questioning whether I was having early Alzheimer’s! I called John and we chatted on Monday. He was a super nice guy and an Emmy winning writer formerly with the Cosby Show and had a string of credits and hits. 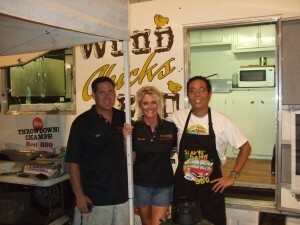 What was a surprise; he was also a competition BBQer who had cooked with Chris Lily and Myron Mixon. We instantly hit it off like BBQ two bubbas. Lindsay the supervising producer, called me Tuesday and we were off on our whirlwind adventure. John’s show features a behind-the-scenes glimpse of seven pitmasters as they compete for bragging rights and money in large BBQ contests across America. Lindsay, my assigned producer for Episode #1 flew in from NY joined a cameraman and production assistant. They met me at work (I took a vacation day) to shoot segments of my worklife to incorporate into the show. We shot segments at my office, meeting rooms, gym, datacenter, and me leading my meditation group at work. We then went back to my house and they shot Mark and me packing and getting ready for the trip. Brian, Amy, and Shilo were also in the home shoot. I now have a lot more respect for TV personalities. It’s not easy to talk in front of a camera. Your brain immediately checks out the moment the camera starts rolling. It took me a while to get used to it. Thankfully Lindsay was patient and supportive as I eventually got the hang of it and stopped staring at the camera. Now, I know how good Anderson Cooper is when he does his natural talk-into-the-camera news segments. Trust me, it’s not easy and I flubbed what I was saying many times! We left around 8:30 pm with the producer and camera man in my van. The production assistant followed in a chase van. During the 6-hour drive, they shot segments of Mark and I chatting about our game plan and thoughts on how to win at Mesquite. We arrived at the Casablanca Casino around 2 am and called it a night. Boy, it was a long day. On Friday, we found that they plunked us right between two of the best teams in America: Pellet Envy from Kansas (the current #1 team in America) and Jack’s Old South from Georgia. That’s equivalent to being sandwiched between Tiger Woods and Phil Mickelson if you’re a golfer. No pressure. No pressure indeed. 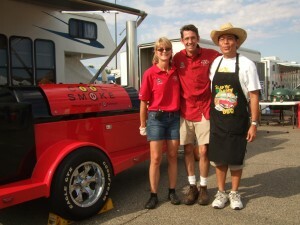 Around us were also the other teams in the TV show: Cool Smoke from Virginia, Wood Chicks from Virginia, Smokin Triggers from Texas, Geer Pits from Texas, and Pablo Diablo from Texas. I guess we were the only team west of Texas in the show and the only non-professional team. Everyone else were fulltime competitors, restaurateurs, and caterers. 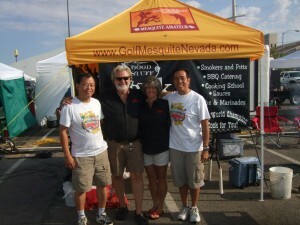 We went around to meet and greet the six other pitmasters and their team mates. Everyone was super nice and friendly, and even shared their turn-in samples with us. What a treat! Mark and I cooked our usual California-influenced recipes which worked for us in the past and we came in 13th of 47 teams (4th ribs; 13th brisket; 14th pork; 35th chicken). We also did the steak entry and finished 23rd of 42 and 21st of 28 in my dessert desert entry where I made key lime pie for the first time. This would have been a routine contest if not for freak hail storm that hit us at 2:00 am. The lone camera person Carter who was on duty from midnight to 6 am was in our booth with camera rolling when we were hit with 50 mph winds, rain coming down in sheets, lighting and thunder right over us, and marble sized hail hitting us horizontally in the face. Luckily Dave Malone, my co-worker and fellow competitor from LA was in my tent helping to me hold on our EZ up for dear life. 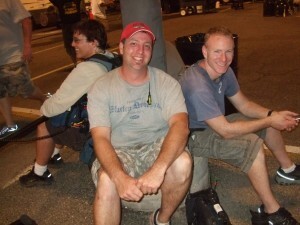 We thought we would get electrocuted on TV as we held onto our steel canopy in the midst of the lightning storm. It seemed like an eternity but the storm blew by in about 20 minutes. The entire site looked like a war zone with torn canopies, blown away equipment, and tipped over Eggs. Our electrical power went out and our Stoker cooking computer was drowned out. Luckily, we brought a backup computer and battery inverter power supply so we resumed cooking in 20 minutes. Hey, being an IT disaster recovery project manager definitely helped. The Executive Producer who saw the segment clip later remarked that it rivaled the intense 60-foot wave storm scenes he produced for the Alaskan crab fishermen show. And all this happened in a casino parking lot in the middle of the desert! The TV show definitely got the defining footage for their season premiere episode.